It’s New Years Eve, the end of another year; and the beginning of a bright new one full of hope and promise. We are usually away with friends at this time, but this year it’s just the two of us at home. So, I have planned a simple, yet elegant dinner for two, finishing with our favourite dessert, Crème Renversée au Caramel, which I like to serve with a bowl of segmented orange pieces in their own juice. It’s something I’ve always done, it just works, and everyone loves it. Now, although I have made this wonderful dish countless times over many years, and I feel that I have ownership of this recipe, it’s not mine. This is one of Paul Bocuse. And it is the perfect way to finish any dinner, rich, but not cloying, beautiful to look at, and not too hard to make. Any leftovers make the perfect breakfast with a cup of tea. Well, we all have our little quirks. Put the milk and the vanilla bean into a saucepan and bring it to a simmer. Turn the heat off, and let steep for about 15 minutes. Now prepare your caramel. In a small saucepan put the 8tbsp of sugar and 2tbsp water. Over a low heat, cook the mixture slowly. The sugar will start to melt and become caramel. This can take up to 5 minutes. When it is ready, pour the caramel into a 25cm metal cake tin, turning the mould in all directions so it becomes coated. Set aside. Combine the sugar and the eggs in a bowl and whisk for a few minutes until well combined. Remove the vanilla bean from the milk and scrape the seeds into the egg mixture, and then pour the warm milk into the bowl, stirring constantly. Strain through a fine sieve into the prepared mould, and place it in a shallow baking pan on a tea towel. Fill the baking pan with nearly boiling water 2/3 up the side of the mould and bake in a preheated 150C oven for 1 hour. Test with a toothpick into the centre of the custard, if it comes out clean, it is cooked. Let cool in the mould overnight in the fridge. Unmould onto a large dish with a rim just before serving. 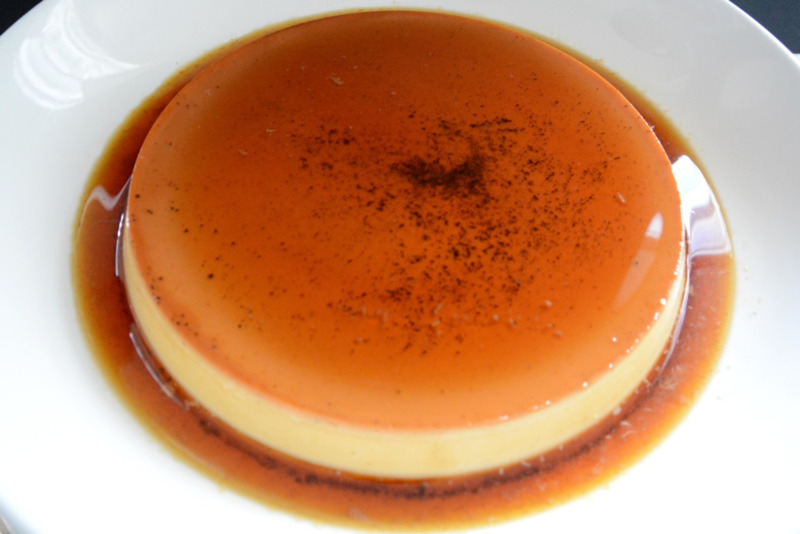 There will be a lovely pool of amber coloured caramel syrup surrounding the Crème Caramel, just gorgeous. Happy New Year everyone, and have a wonderful 2015.